Our final stop on our tour of the Turquoise Coast of Turkey was the city of Antalya. It is a large city, with a population of over a million people, so it was quite a different feeling than our visits to Patara and Kas! The biggest tourist draw is the large old city called Kaleiçi, which dates from the city’s heyday as a port during the Roman Empire. We decided to stay in Kaleiçi itself in order to be close to all the sites. On booking.com we found a nice small place called the Marina Hostel that, as its name suggests, is near the harbor. 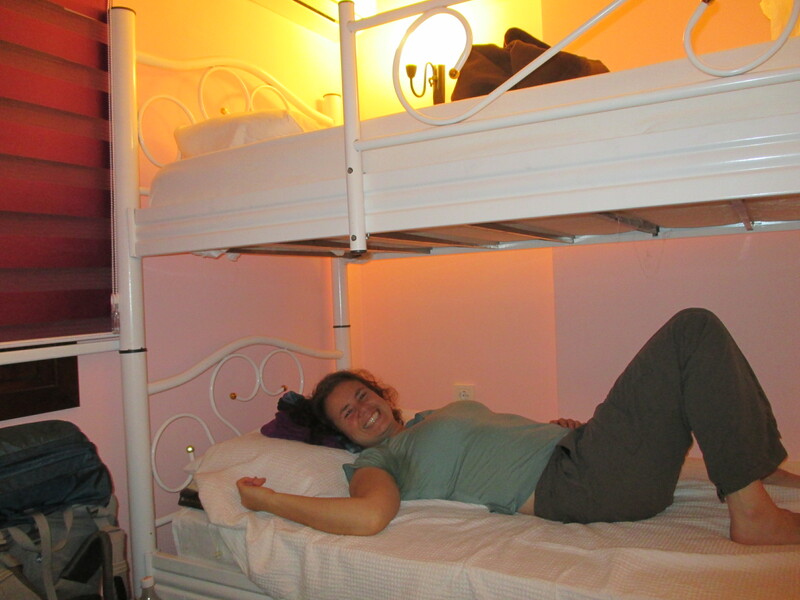 We took a chance and booked beds in a 6-person dorm room… and lucked out and had the place to ourselves all four nights! The hostel also came with a nice Turkish breakfast every morning. One thing we did notice when wandering around the district was that shopkeepers were pretty aggressive with trying to get you to come into their store. We thought they were more persistent than those in the famed Grand Bazaar in Istanbul, maybe because they were getting less business in the low season. We ran into one man in particular who was pretty interesting. He knew of a few towns in Colorado so he was able to get our attention. Of course he then invited us into his carpet shop but we had to decline as we quickly walked away. We ended up running into him the next two days as well, and of course he remembered us each time! The last day in town we purposefully avoided the area where his shop was so we wouldn’t have to again explain to him that we weren’t going to buy a carpet. Antalya Museum – We took the Antalya’s “nostalgic tram” out to this large archaeological museum. By this point, we had seen a few similar museums, but we still enjoyed seeing the different exhibits that included the Stone Age in the Antalya area, ceramics, Roman-era sculptures and sarcophogi, and finally a small exhibit on life during the Ottoman era. Our favorite exhibit was a room with different sculptures of Greek/Roman gods found at the nearby site of Perge, mainly because each statue included a sign with extensive text describing the myths around the god. Kaleiçi Museum – This small museum had a few different exhibits that we spent a couple of hours touring. In an old Greek Orthodox church, there was an exhibit of 18th century pottery from the Çanakkale region. Also, in the upstairs area there was a fascinating exhibit with pictures of old street vendors from Istanbul in the late 19th century. We really enjoyed just seeing all of the different types of vendors there were! Back in a restored Ottoman-era house, the main exhibit showcased life in Antalya during that time, with mannequins set up in different rooms showing scenes from preparations for a wedding: serving coffee to guests, a henna ceremony for the bride and a shaving ceremony for the groom. Some Random Ethnographic Museum – When we were looking for the Kaleiçi Museum, we stumbled across a place that we thought was it. It was a restored Ottoman-era house, and the ground floor had mannequin displays of cultural artifacts from Antalya and its sister cities. The upstairs area also had a few rooms set up as displays. We were confused that there was no admission though, and there was only one person in the building, and she seemed to be doing something else. Since we found the actual Kaleiçi Museum, we aren’t really sure what this was, but it was a nice, free way to spend a little time! 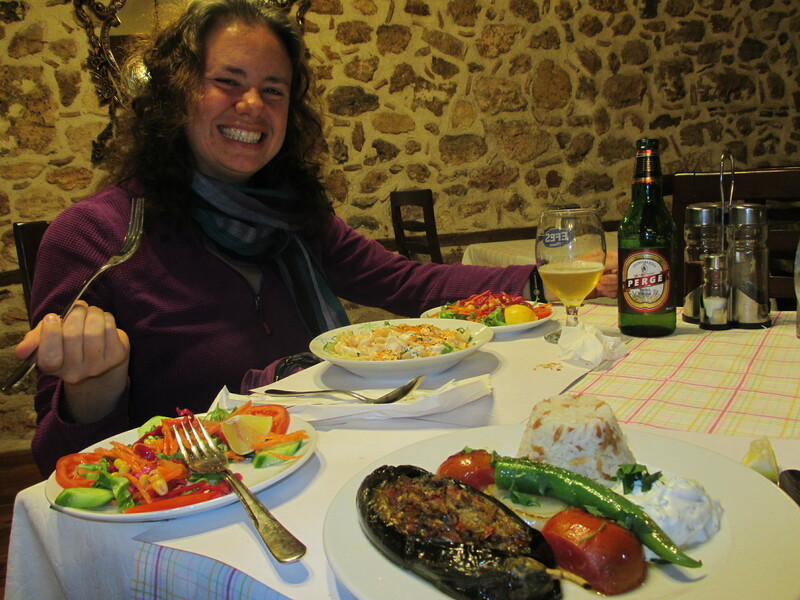 Kaleiçi had a good number of restaurants along its cobblestone streets, but some of them seemed to be shutting down for the offseason. One night we ate at a place near our hostel that the Lonely Planet had recommended called Yemenli. Eric enjoyed an appetizer of a local white bean salad where the beans had been mixed with tahini. The best place for cheap eats near Kaleiçi is a string of fast food-esque restaurants near the main entrance to the district. Every time we walked by this area the waiters would try and entice us to come in. 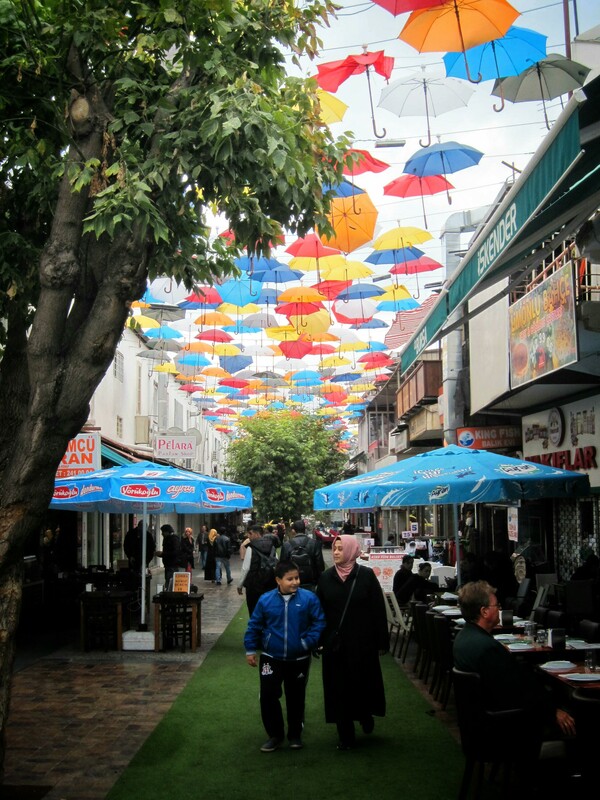 We enjoyed one of the streets of this restaurant area which was covered with umbrellas. It was a little bit of a walk from the hostel, so we only ate in one of these restaurants. We chose one that had a good soup collection since the night was chilly. Antalya was a nice place to visit, especially with all of the dining and activity options offered compared to previous stops along the Turquoise Coast. However, even this large city felt a little bit of a low season slowness, so if we came back we’d aim for warmer weather.